FX Market Code – free system by Russ Horn. System comes with TradeOnix (our review of Tradeonix / Tradeonix official website). The indicator inside of the price section of the chart is called the MarCo indicator. The one below the price is called the MarCo-OsMA. The FX Market Code trading system capitalizes on the essentials of the market movement. The market moves in a trending manner, and inside of those trends it moves in waves. 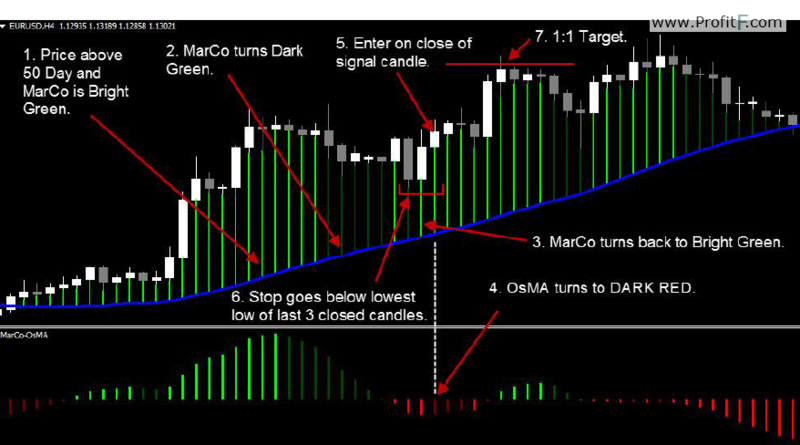 The MarCo indicator will first identify the trend direction and then identify the waves. The OsMA will then take over and validate the wave strength. 1. Trend: It identifies the overall trend direction, this is the direction we want to trade. 2. Pullbacks: It identifies the pullbacks within the trend and then identifies when the trend resumes, giving us entry signals. There is a Blue line that runs through the price. 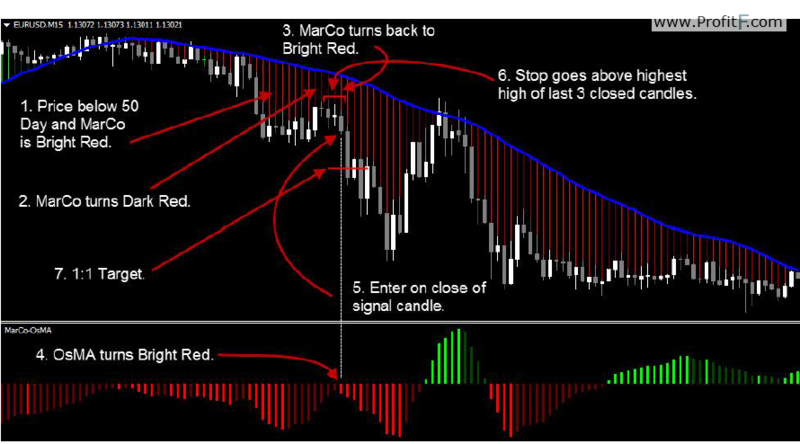 This is the 50 Day Moving Average that is commonly used by traders all over the world to determine trend direction. When price is above the 50 Day, the trend is up. When the price is under the 50 Day, the trend is down. When price is above the 50 Day Moving Average, the MarCo indicator will print Green bars. The Marco will print Bright Green bars when the price is moving with the trend, or upward and away from the 50 Day Moving Average. The MarCo will print Dark Green bars when the price begins to move against the trend towards the 50 Day Moving Average. Once the pullback has finished and the market begins to move back in the trend direction, MarCo will start to print Bright Green bars once again. When price is below the 50 Day Moving Average, the MarCo indicator will print Red bars. The Marco will print Bright Red bars when the price is moving with the trend, or downward and away from the 50 Day Moving Average. 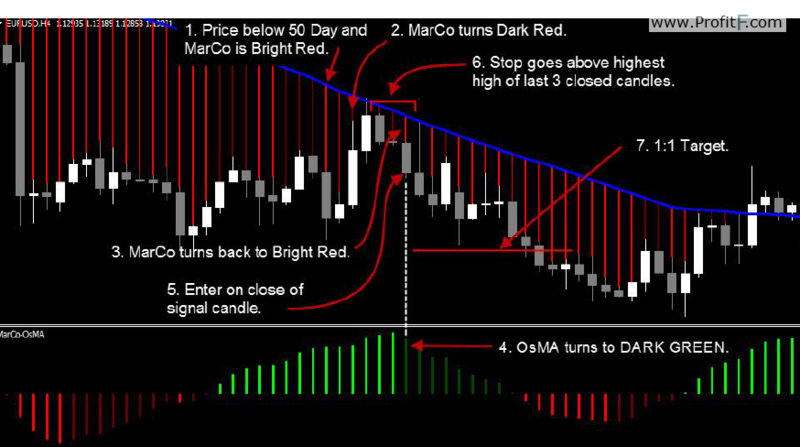 The MarCo will print Dark Red bars when the price begins to move against the trend towards the 50 Day Moving Average. Once the pullback has finished and the market begins to move back in the trend direction, MarCo will start to print Bright Red bars once again. The pullbacks are what we want to see when looking to take a trade. In an uptrend, we want the MarCo to start with Bright Green bars, then print Dark Green bars and then turn back to Bright Green. In a downtrend, we want the MarCo to start with Bright Red bars, then turn to Dark Red bars, and then turn back to Bright Red. 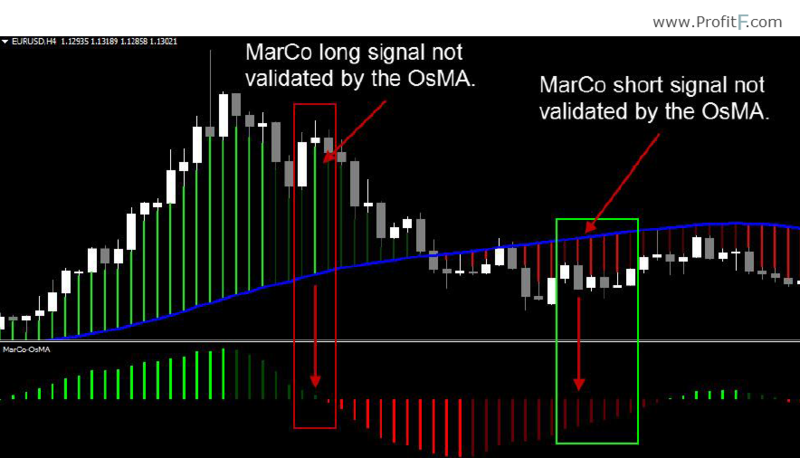 The OsMA is how we validate the signals given by the Marco indicator on the price chart. 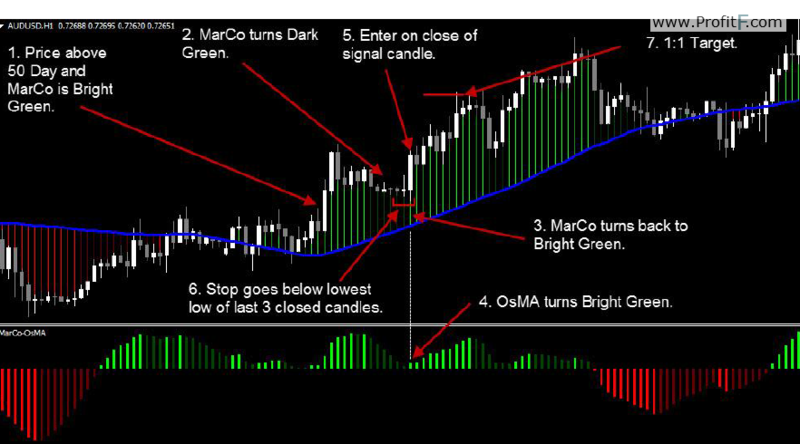 The Bullish OsMA is composed of Bright Green bars and Dark Green bars. The Bearish OsMA is composed of Bright Red bars and Dark Red bars. The Green bars on the OsMA are bullish in nature. In a conservative manner, we will only take buy trades in an uptrend when the OsMA turns Green and prints Bright Green OsMA bars. We can have an uptrend and Red OsMA bars, but this would be a no-trade scenario in a conservative approach. The Red bars on the OsMA are bearish in nature. In a conservative manner, we will only take sell trades in a downtrend when the OsMA turns Red and prints Bright Red OsMA bars. We can have a downtrend and Green OsMA bars, but this would be a no-trade scenario in a conservative approach. The OsMA measures momentum in the market, and when momentum fails, there is a possibility that the market can change direction. The Aggressive Bullish OsMA are the Dark Red bars. The Bright Red bars denote strong downward momentum, so when they turn to the Dark Red bars, they hint to a failure in the downward momentum. The Aggressive Bullish OsMA are the Dark Green bars. The Bright Green bars denote strong upward momentum, so when they turn to the Dark Green bars, they hint to a failure in the upward momentum. The MarCo indicator is how we are going to know what direction the trend is and then what direction to trade. I want to take a moment and look at why we want to trade with the trend direction and not trade against it. Of course, there are counter-trend trading opportunities, but those opportunities are fewer than the trend-following opportunities, and they are harder to pinpoint. The MarCo indicator does a brilliant job showing us the direction of the trend. This is the first trade setup that we will come across. The trend changes from up to down or from down to up. We will find opportunity in these trend changes. 1. Price crosses and closes above the 50 Day Moving Average. 2. The MarCo-OsMA is printing Bright Green bars. 3. 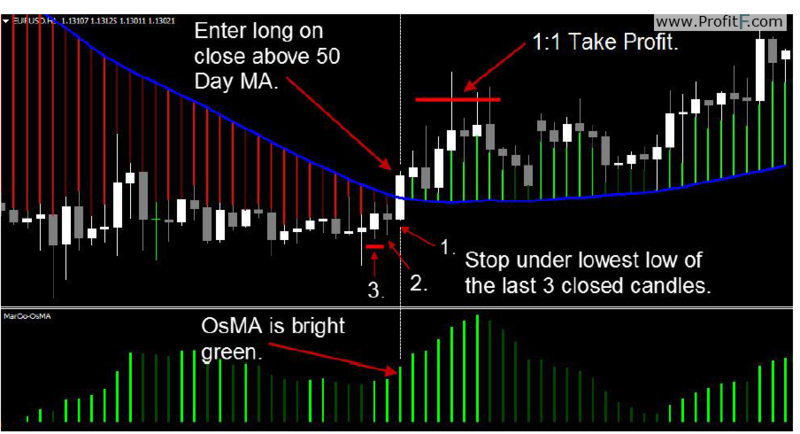 Enter on the close of the first candle that closes above the 50 Day MA and has a Bright Green OsMA. 4. Stop loss goes under the lowest low of the last 3 closed candles (this will include the signal candle). 5. Take Profit is 1:1. 1. Price crosses and closes below the 50 Day Moving Average. 2. The MarCo-OsMA is printing Bright Red bars. 3. 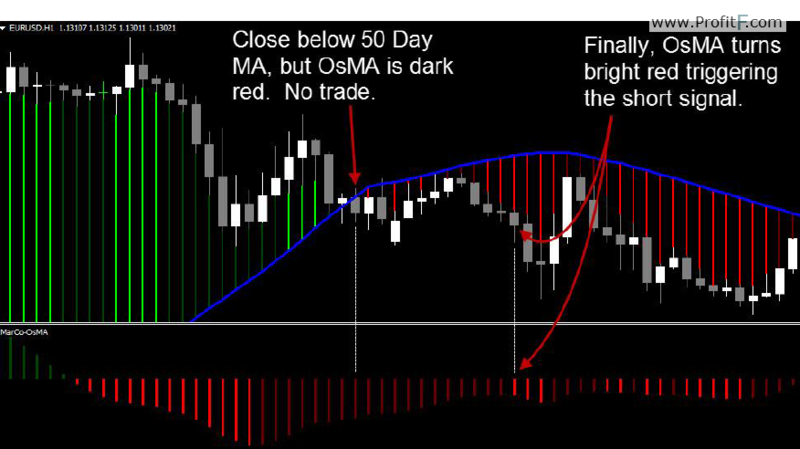 Enter on the close of the first candle that closes below the 50 Day MA and has a Bright Red OsMA. 4. Stop loss goes above the highest high of the last 3 closed candles. 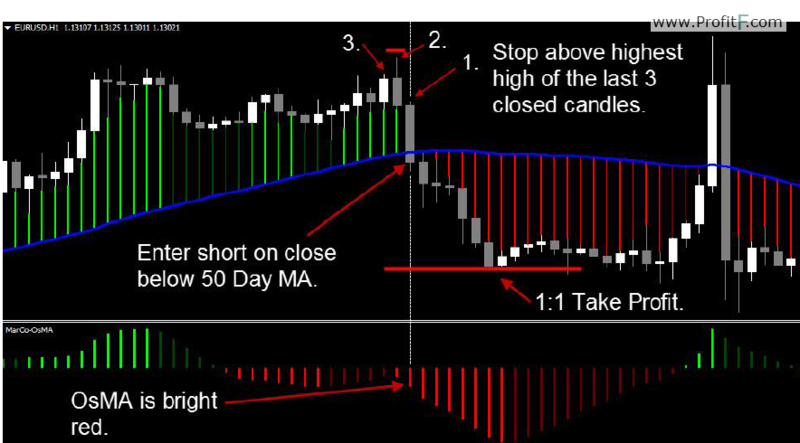 Trade signals don’t always occur when a candle closes past the 50 Day MA. Sometimes the signal is late. Here are a couple of examples of late Trend-Change trade signals. * Conservative trades are not as frequent as you might expect. They are harder to come by than the Aggressive signals. 1. The price is above the 50 Day MA and the MarCo is Bright Green. 2. The MarCo turns Dark Green. 3. The MarCo turns back to Bright Green. 4. 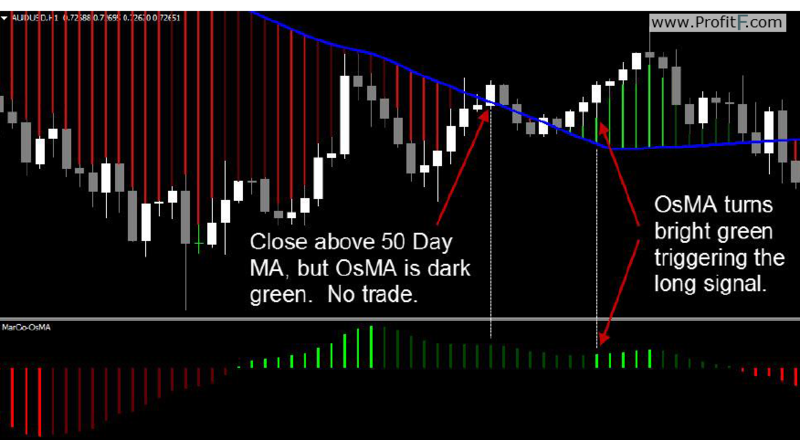 The OsMA has remained Green during the pullback and then turns, or is, Bright Green. 5. 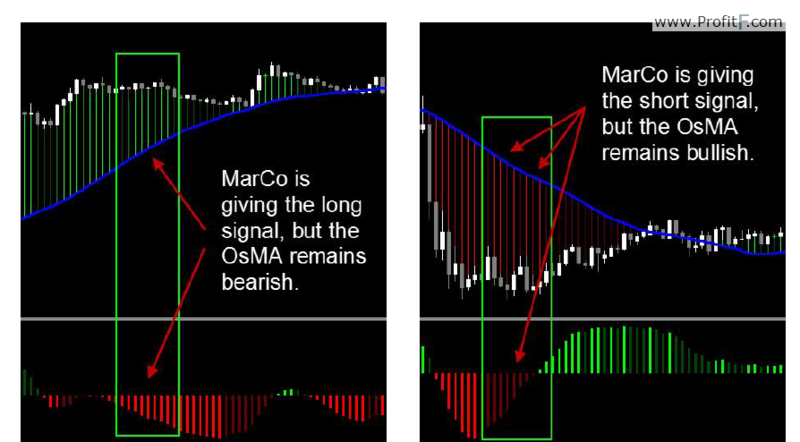 Enter on the close of the signal candle that turns the MarCo and the OsMA Bright Green. 6. Stop loss goes just under the lowest low of the last 3 closed candles (this will include the signal candle). 7. Profit target is 1:1. 1. The price is below the 50 Day MA and the MarCo is Bright Red. 2. The MarCo turns Dark Red. 3. The MarCo turns back to Bright Red. 4. The OsMA has remained Red during the pullback and then turns, or is, Bright Red. 5. 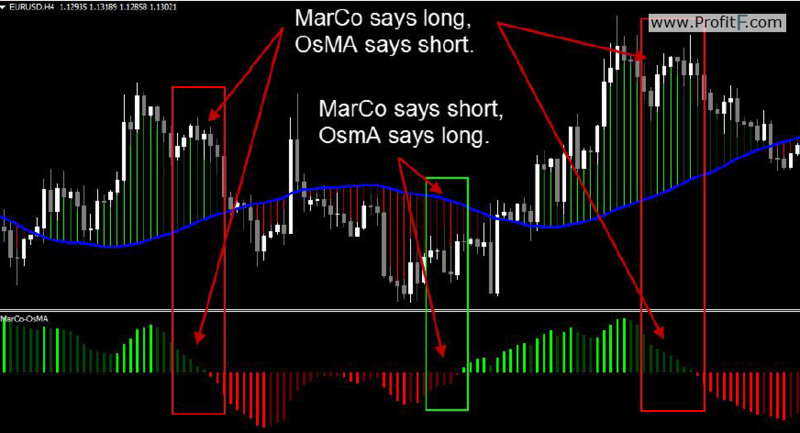 Enter on the close of the signal candle that turns the MarCo and the OsMA Bright Red. 6. Stop loss goes just above the highest high of the last 3 closed candles (this will include the signal candle). 4. The OsMA turns, or is, DARK RED. 5. 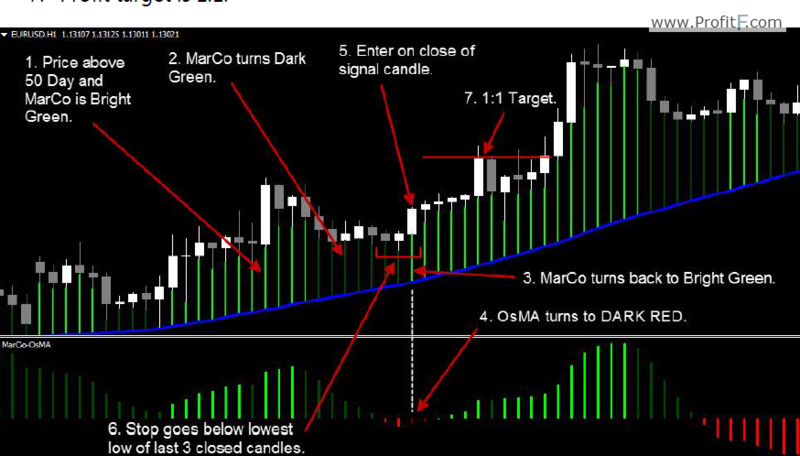 Enter on the close of the signal candle that turns the MarCo Bright Green and the OsMA DARK RED. 4. The OsMA turns, or is, DARK GREEN. 5. 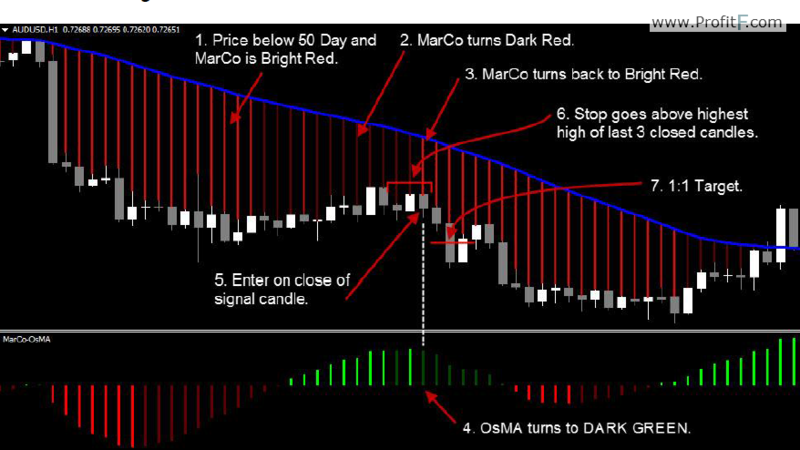 Enter on the close of the signal candle that turns the MarCo Bright Red and the OsMA DARK GREEN. Russ, the system looks great – particularly the trades taken with the trend as opposed to Trend change. I have a question: for trades with the trend that require a pullback, whether aggressive or conservative, what constitutes a pullback? One candle with a dark line, two, more?